The Fire Detection Control Panels Series BC600, Series BC216 and BC016, provide freely programmable open-collector control outputs. The open-collector outputs are connected to flat cable connectors, each with 8 outputs. The Relay Modules RL58-1 and RL58-2 allow for the easy conversion of these control outputs to dry changeover contacts. The componentry is connected to the fire detection control panel via a flat cable. The RL58-1 provides eight relay outputs with a maximum contact rating of 1A/60VDC/30W. The RL58-2 offers four relay outputs with a maximum of 5A/230VAC. The terminal of the RL58-2 are designed for mains voltage. Two relay modules RL58-2 are each cascadable via pin connectors. 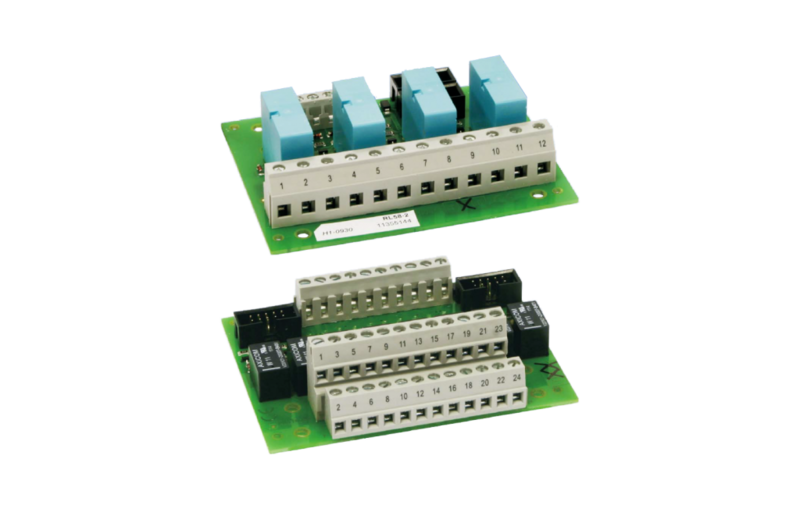 The relay module is delivered with flat cable and mounting accessories for easy installation.